the Bear Blog: Our 11th Celebration of our 20th Anniversary! We just love to celebrate! We find many occasions to celebrate our customers, our store, our employees, the fact that the sun was shining all day yesterday, etc.! You know we have been celebrating our anniversary all year long, right? So, November 20 is upon us! And what better thing to share with you than one of our favorite pattern designers! Pat, of Villa Rosa Designs, is always producing plenty of inspiration! I can't even tell you how many times we have used her patterns, sometimes repeatedly! 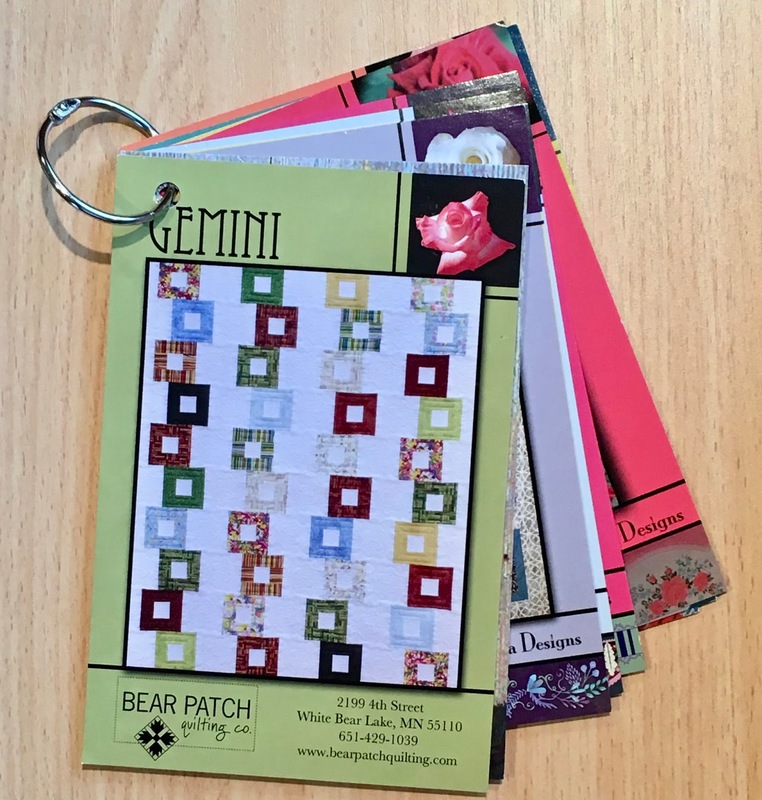 Her patterns are printed on heavy cardstock in glossy color. 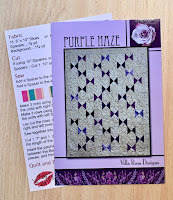 One side of the card is a full picture of the quilt, with the very succinct directions on the reverse side. This is the "no-frills" set of directions, very easy to understand. Many of these patterns are good for a favorite print or panel that you don't want to cut up into little bits. 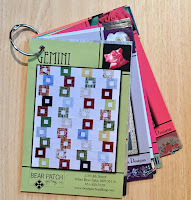 Others are just right for a pack of 5" charm squares or a 2 1/2" roll. There's great diversity! We call them Rosecards, from Villa Rosa. The price ($2.25) makes them perfect to collect for yourself or a friend. And notice that one on top of the stack? It was custom printed for Bear Patch and features the Quilt MN fabric from a couple years back. It was used as an incentive prize for shop hoppers! 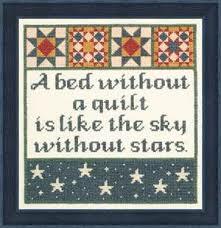 A few years ago, Pat visited Bear Patch and did a "bed turning" show of some of her quilts. We really need to have her back! 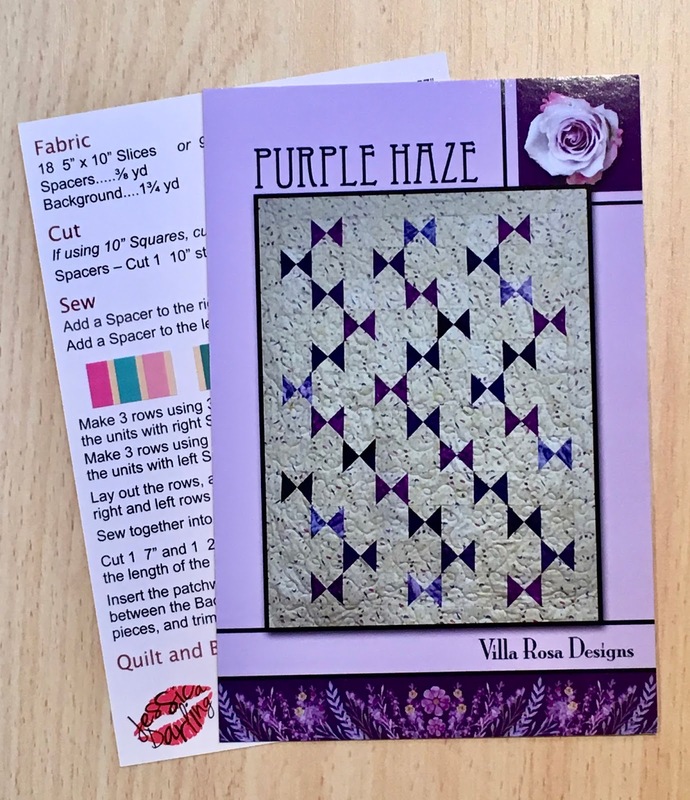 Comparing the picture on the card to a sample made of different fabrics and colors can really bring on that "aha" moment. We are displaying 2 or 3 hot-off-the-sewing-machine samples right now for our Christmas display, and that's a perfect example of how different the resulting quilt can appear from the picture. So, Monday, November 20, from 9am-9pm, we will be handing out 1 Rosecard per customer! No purchase required. Just pick a card and get happy! 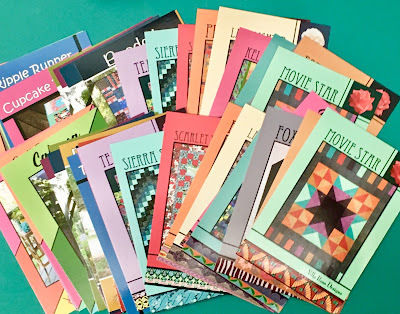 We have a lot of the newest designs to share, carried home from Quilt Market just for you. And, of course, we have many on hand for purchase, if you want to expand your collection.